In Houston County the transfer fee is $3.25. In addition to paying the transfer fee, county officials are required to collect any outstanding and current property taxes on the newly acquired vehicle. 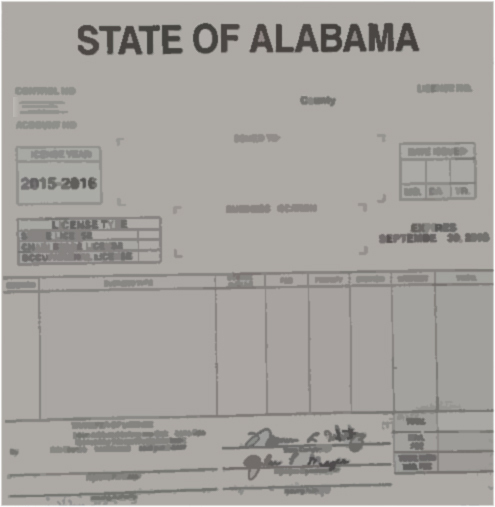 Also, if the newly acquired vehicle was purchased from someone other than a licensed Alabama motor vehicle dealer, state and local sales or use tax may be due. The State of Alabama has an automotive sales tax rate of 2%. Houston County's rate is .50%. The municipal sales tax rates range from 0.50% to 4.45%. Under Alabama law, if the vehicle is being titled for the first time in Alabama or if a non-titled vehicle is being registered for the first time in a new owner's name, an inspection of the vehicle identification number is required. Thus, it would be necessary for the vehicle to be taken to the county office in order to make application for certificate of title and for the vehicle to be registered. Utility trailers are exempt from physical inspections. One completes an application with the Houston County Motor Vehichle Division. The office will make inquiry to the State Motor Vehicle Division to verify if the requested letters and/or numbers are available for issuance. If so, the issuing official will collect the appropriate registration fee, issue a registration receipt, a sixty-day temporary license plate, and the month and year decal to be placed on the new license plate. The license plate will be shipped from the manufacturing facility to the registrant (usually 60 days). A search engine for personalized messages is provided by the the Alabama Department of Revenue see Reservation for Personalized License Plate. The registrant is subject to payment of the standard registration fees based on the type vehicle, plus an additional fee. The additional fee for a standard personalized license plate or for a personalized motorcycle license plate or most distinctive license plates is $50 each time the tag is renewed. In order to obtain the disability access license plates, the vehicle (or vehicles) must be fully or partially owned by the person with the disability. There is no limit on the number of license plates that may be obtained. Anyone obtaining the disability access license plate may obtain one placard; anyone who does not obtain the license plate may qualify for two placards. One temporary placard is available upon certification by the physician, using the application form, that the disability meets the federal criteria and is temporary. The maximum length of time for a temporary parking placard under federal law is six months. New disability application form is required in 2012 to recertify all current users of disability license plates and placards.